Usually it’s Samsung vs. iPhone, but now it’s Samsung vs. Samsung. The mobile giant released two new phones around the world last week: Galaxy Note5 and Galaxy S6 edge 6+. The Lebanese now have the option of two exciting, ultrafast, sleek, big screen Samsung devices, each with specs and features that make them unique and fun to use. With the S6 edge 6+, you get a revolutionary curved design of metal and glass, with the screen elegantly wrapping around both sides of the phone. It has its trademark edge, giving you quick access to your favorite contacts, and now also an additional edge for your favorite apps. You can set a different color for each contact, so you’ll know who’s calling when you see it light up. Its huge 5.7″ Quad HD SAMOLED screen and Ultra High Quality audio make it a great phone for multimedia. You can also live stream whatever you’re doing using the “Live Broadcast” function, and share moments in your life with friends as they happen. If you want to capture a moment before it’s gone, the camera opens in 0.6 seconds with a double tap. The battery charges fast too, going from 0 to 100% in 90 minutes on a regular charger, and in 2 hours on a wireless charger. Meanwhile, the sophisticated Note5 makes use of the efficient s-pen that distinguishes the Note series. It controls Air command, giving you quick access to frequently used functions, and lets you jot down notes. The phone takes screenshots as you scroll (for as many as 22 pages) so you can save whole articles as seamless images. The mighty s-pen lets you write notes on those screenshots, and if you want to jot something down you can even do that without unlocking the phone. As soon as you pop the pen back in the phone, the images save automatically. 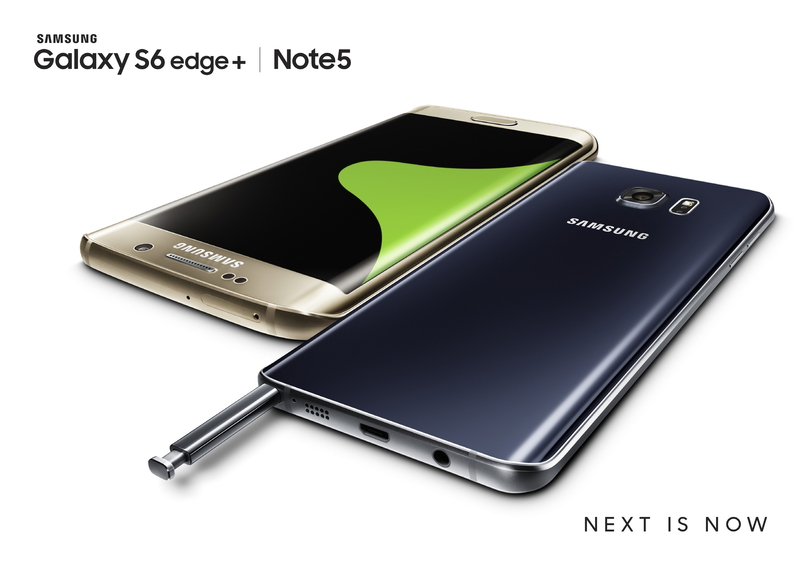 Like the S6 edge +, Note5 gives you 5.7″ in screen space, and charges quickly, wired or wireless. Both are beautifully modern, dynamic devices, but the bottom line is that if you’re looking to get organized and get more done faster, go for the Note5, whereas if you’re a multimedia junkie, you’ll definitely enjoy the S6 edge +.